The initial consultation lasts 2 hours. During this time, concerns and health history are discussed in great detail. Additionally, a brief Chinese medical physical is performed, which includes pulse-reading, the measuring of point sensitivity, tongue inspection, and a few other simple diagnostics. Clients are then advised about the frequency of treatments and are encouraged to observe themselves between sessions. This helps Diane to individualize treatments and make recommendations for ways in which to re-create the benefits of treatment for long-term care. Thereafter each session lasts about 55 minutes. Diane is credentialed through Blue Cross Blue Shield and Aetna insurance companies. For those who have acupuncture insurance coverage with other companies, she can submit claims as an out-of-network provider for your convenience. To find out if you have acupuncture benefits, please contact Diane with your full name, policy identification number, date of birth, the date of birth of the primary card holder if it is not you, and zip code. 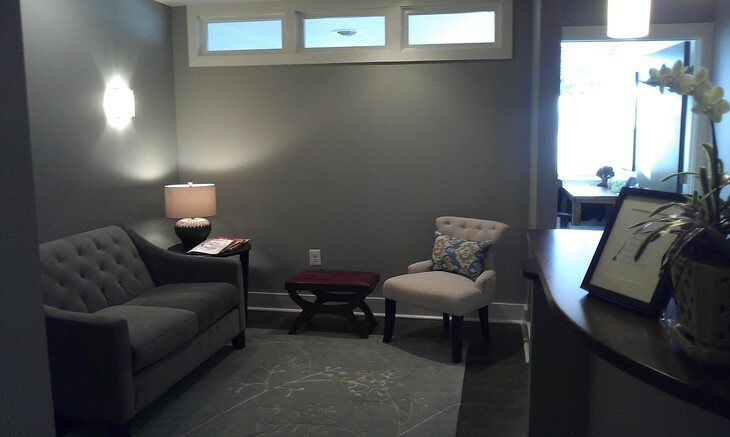 A peaceful waiting room welcomes you.